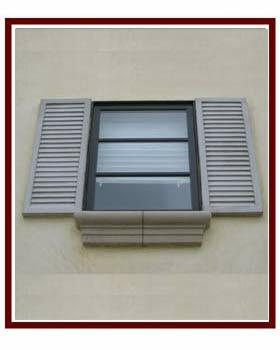 South Coast Foam Shapes offers a beautiful line of Foam Core Shutters. We developed this product to fill a critical need in the construction industry: Shutters with low maintenance and no long term liability issues. Our shutters are light weight and easily installed with adhesive only. No mechanical ties to penetrate the waterproofing membrane of the building and create leaks and future liability. No need for the builder or developer to bituthane or waterproof the backing for the shutter. There is no backing. Homeowners can retrofit without causing interior wall leaks. Can easily be installed by the average homeowner with a notched trowel. NOTE: Standard depth of shutters is 2"
With a hard cement base and genuine wood grain appearance our shutters dress up any project. We also wood grain beams, corbels, arch surrounds and other architectural features. Our Wood-Graining process is authentic and undetectable. Call 951-656-3131 for quotes or use our contact form.